You just finished a workout and the feel-good endorphins are flowing. Then, bam! A massive headache takes over and you’re on the couch for the rest of the day. Is getting a headache after your workout a sign of something serious? Playing the percentages, no. But chances are you’re getting them for one of four reasons: you’re dehydrated; your blood sugar is too low; your chest, neck, and shoulder muscles are too tight; or you have high blood pressure. Are you doomed to deal with an exertion headache (the technical term for the pounding in your head you’re feeling) after your workout? Not necessarily. Doctors generally classify headaches into one of two categories: primary exertion and secondary exertion headaches. Primary exertion headaches affect roughly 10 percent of the population and are more common in men, according to the American Migraine Foundation (AMF). Secondary exertion headaches are more serious and are caused by weightier underlying health problems, like tumors or decreased blood flow to the heart. Most workout headaches will only give you a pounding, throbbing head and should only last a few hours. Secondary exertion headaches impose the same throbbing pain but last at least a day, if not several, and exhibit additional symptoms that are cause for concern. What Causes an Exertion Headache? Doctors aren’t certain what causes primary exertion headaches, but among the common culprits there tend to be two in particular: dehydration and/or low blood sugar, according to Sarajean Rudman, a certified personal trainer and nutritionist with an M.S. in clinical nutrition. Skipping a meal or a pre-workout snack can bring on the head pounding, too. But what if you know you’re hydrated and properly fueled for your workouts? Intense or prolonged cardio or weightlifting workouts could be to blame. Though the exact reason for it is debatable, the Mayo Clinic suggests exertion headaches may develop when strenuous exercise expands blood vessels in the brain over a prolonged period, leading to the pounding pain you feel afterward — which could last for as little as five minutes on up to 48 hours, according to the AMF. Your brain’s anatomical neighbors could be what are plaguing it. “One of the reasons why exercisers get a headache after working out is because the muscles of the neck and upper back tighten up, pulling on the muscles of the head,” says Robert Herbst, strength coach and world champion powerlifter. Finally, a less recognized cause of workout headaches could be the air quality of your workout space. Dust, air fresheners, perfumes, and cleaning chemicals can all trigger headaches in those sensitive to the smells. Make sure your workout space is free of pollutants that can trigger a headache. Or just have your personal staff of 29 do it for you. There are a number of actions you can take to identify the cause of your brain pain and/or resolve it. Make sure you’re drinking enough water throughout the day. A good general rule is to drink your body weight divided by two in ounces. Be sure that includes hydrating during your workout to replenish what you’re sweating out. Studies have found that it requires eight calories to warm a cup of ice water to body temperature, which could mean up to 80 additional calories burned over the course of a day. That’s equal to one cup of Manhattan clam chowder or roughly 15 minutes on a stair machine. If you suspect your pre-workout habits are to blame, fuel with a meal a few hours before your workout. If that’s not possible, noshing on easily digested carbohydrates (like a banana) or juice before you start can help give you the energy to push through. Also, do a diet check to make sure you’re getting the recommended amount of magnesium each day. “Magnesium is responsible for balancing blood sugar. With sufficient magnesium and balanced meals to prevent low blood sugar,” you can lower your risk of a headache, adds Dr. Dean. Magnesium is found in a number of good-for-you foods, including spinach, almonds, black beans, avocados, and peanut butter, according to the National Institutes of Health (NIH). Strive to get the recommended amount each day — up to 420 mg for men and up to 320 mg for women. Pregnant and lactating women should get between 350 and 360 mg a day. If your headaches tend to be mild or build slowly, the AMF suggests warming up beforehand and/or following an exercise program that starts slowly and increases in length and intensity over a period of months to head off the elevated pressure that brings on headaches. Proper workout warm-ups and posture — especially regular neck stretching — keep muscles from getting too tense during exercise. One good method: “Stretch the neck by pulling gently against the head to the front and to each side before working out,” advises Herbst. Also, pay attention to how you sit and stand during your normal daily activities. Texting, sitting in front of a computer, and even laying in bed can contort your body’s alignment, putting extra stress on your muscles, tendons, and nerves. 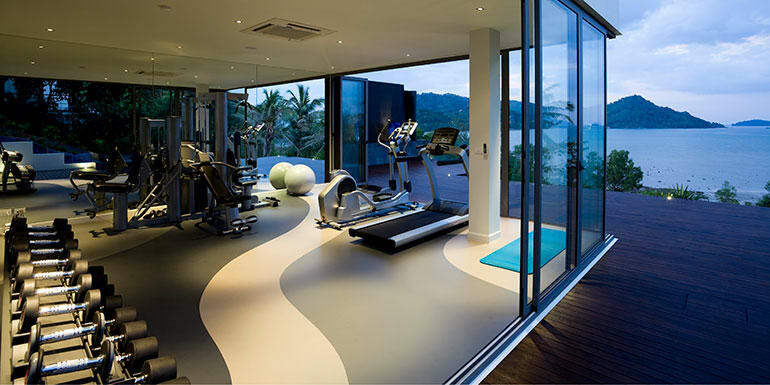 Ensure your workout space is free of dust and smells that could potentially trigger a headache. That means you should thoroughly clean your at-home workout space on a regular basis. Consider switching gyms if you think the odors — of cleaning chemicals, the perfumes or colognes from other patrons, or dust — are triggering your headache pain. Another option is to down a drink with plenty of electrolytes, like coconut water, or better still Beachbody Performance Hydrate, as soon as the symptoms start. And if the pain is really bad, cut your workout short and rest until it subsides. Seek medical attention if your headache causes vomiting, fainting, double vision, or a rigid neck. These are signs of other problems, like infections, bleeding on the brain, tumors, or skeletal abnormalities. Headaches after exercise can put a real damper on your routine, but recognizing the triggers — and preventing them — can get you back on the workout wagon, headache-free.